Below, you can peruse all current NLA lessons. Each lesson takes an average of 8-15 minutes for students to complete. If you would like to use any of the lessons, please visit the Using the Lessons page for information on how to receive lesson links. Academic research articles have a structure and language that is different from our other reading materials such as textbooks. This lesson can help students new to academic research understand these differences and learn strategies for finding information in such articles. This lesson is also available in the Peer-Reviewed Instructional Materials Online project database. Lesson created by Alice Anderson, Ashley Stark, Prasanna Vaduvathiriyan, Rachel Vukas, and Robyn Hartman in 2018. Citations are more than just a formality that protects against plagiarism. 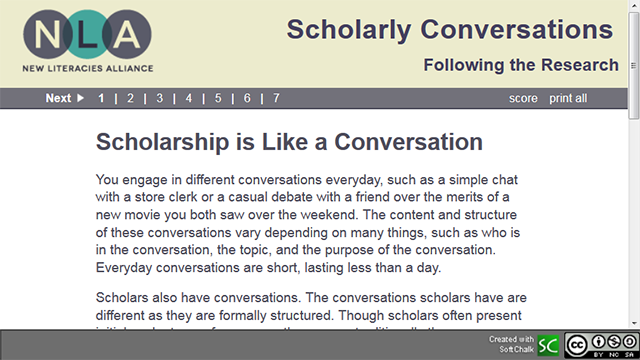 They allow individuals to participate in a scholarly conversation that is taking place among researchers in a specific field. In this lesson, students will explore types of citations and how citations can be used in academic writing. Lesson created by Robyn Hartman, Julie Hartwell, Geoffrey Iverson, Eric Kowalik, Kendall Roemer, and Matt Upson in 2016. Jumping into research on a specific subject may feel overwhelming when faced with the vast amount of information that has been published on the subject. 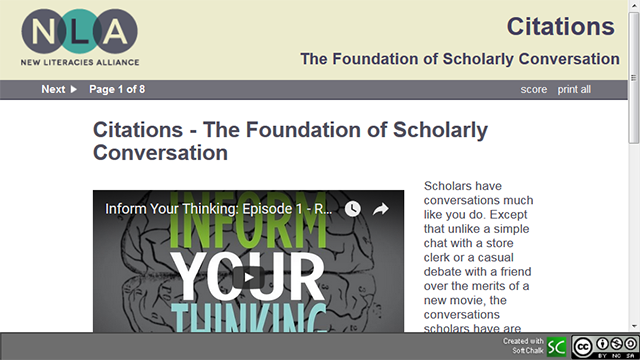 In this lesson, students will discover how research is like a conversation that takes place between scholars in a field and will investigate ways they can become part of the conversation over time. Lesson created by Alice Anderson, Ashley Flinn, Julie Hartwell, Heather Healy, Geoff Iverson, Sara Kearns, Kate Otto, Ashley Stark, and Rachel Vukas in 2016. What makes someone an authority on a topic? How do you know when to trust what someone has said or written? In this lesson, students will learn to identify authoritative voices and discover that authority is both constructed and contextual. Lesson created by Andrea Baer, Ashley Flinn, Melia Fritch, Robyn Hartman, Heather Healy, and Joelle Pitts in 2016. With the vast amount of information that can be found as quickly as a mouse click, it is easy to think that all information is free. However, information and access to it is paid for by someone and is not all created equally. 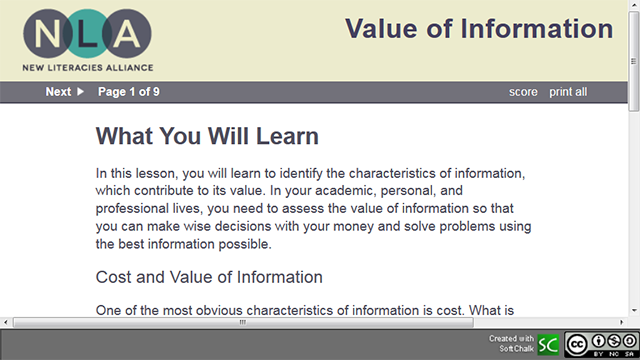 In this lesson, students will explore the value and cost of information and learn how to make wise information decisions. Lesson created by Alice Anderson, Heather Collins, Ashley Flinn, Julie Hartwell, and Heather Healy in 2016. This is the second version of the lesson. In our knowledge society, individuals must know how to identify and use data, information, and knowledge. 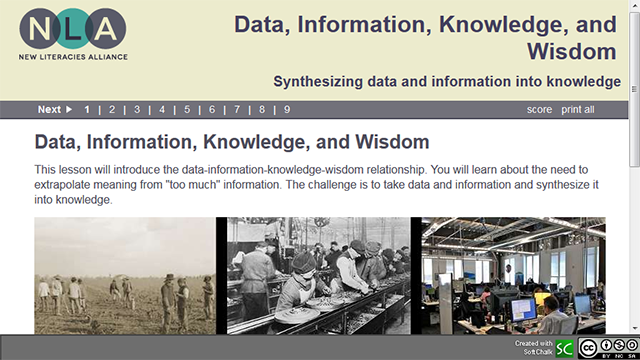 In this lesson, students will differentiate each of these and explore how data and information can be synthesized to form knowledge, which can lead to understanding and wisdom. Lessons created by Alice Anderson, Heather Collins, Ashely Flinn, and Julie Hartwell in 2015. 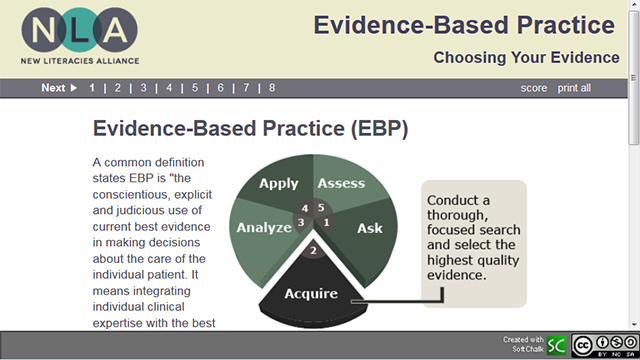 Evidence-based practice is a five-step process. 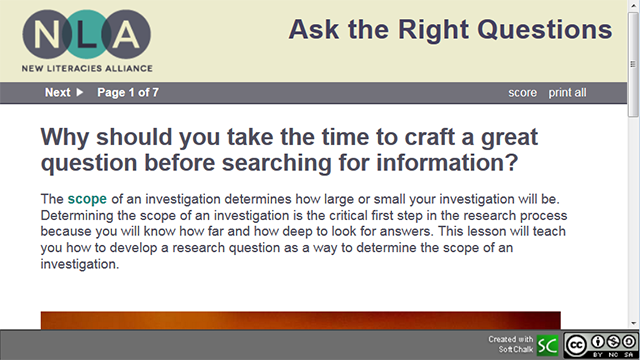 The second step, acquire, means to conduct a thorough, focused search and select the highest quality evidence. 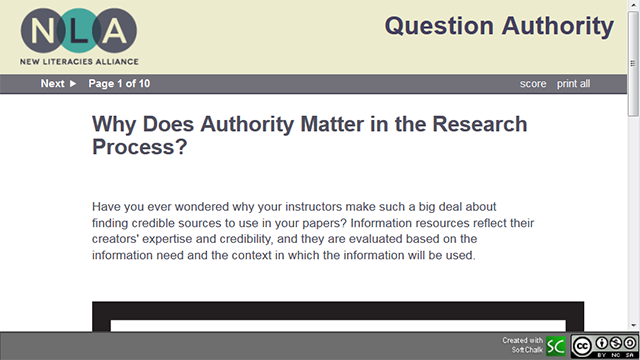 This lesson addresses how one matches a clinical question to the types of research evidence. Lesson created by Alice Anderson, Heather Collins, Holly Luetkenhaus, Debbie Thomas, and Rachel Vukas in 2017. Information is inherently valuable. 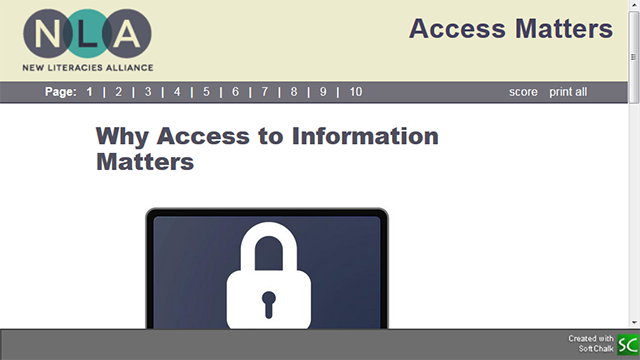 Access to it, or lack of access, has the potential to affect the quality of one’s life. In this lesson, students will learn how access to information shapes people’s lives and how they can make informed decisions related to access to information in their lives and in their communities. Lesson created by Heather Collins, Cristina Colquhoun, Ashley Flinn, Melia Fritch, Heather Healy, Eric Kowalik, Joelle Pitts, and Matt Upson in 2016. Information can come from an assortment of sources and fulfill a variety of information needs. 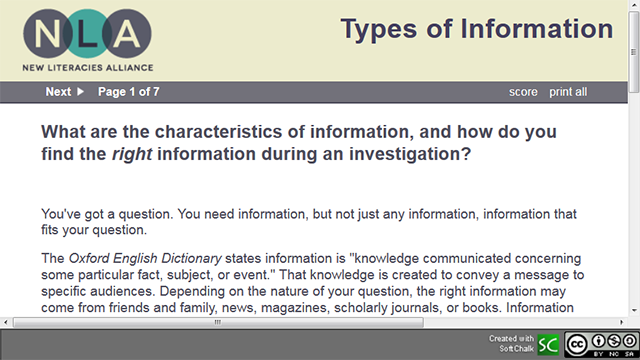 Knowing the type of information needed and where it can be found is a crucial skill for individuals to have. In this lesson, students will examine types of publications and discover use cases for popular, professional/trade, and scholarly sources of information. Lesson created by Alice Anderson, Heather Healy, Kate Otto, Joelle Pitts, and Julie Zimmerman in 2015. There is more to a good search than just entering a few key words. 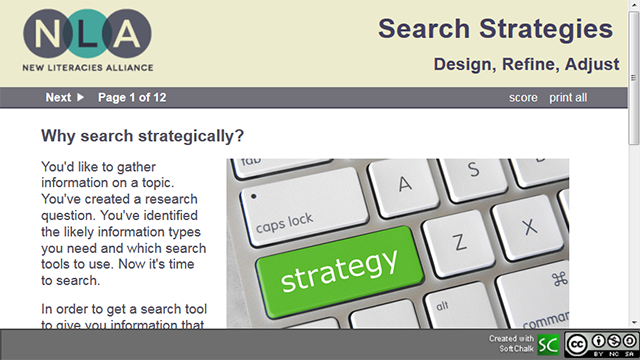 In this lesson, students will examine key search strategies that will help them efficiently find the best information to fit their needs. Lesson created by Alice Anderson, Sara K. Kearns, Joelle Pitts, and Rachel Vukas in 2015. This is the second version of the lesson. When looking for information, one of the first steps is to develop a research question to figure out the scope of what exactly is needed. In this lesson, students will explore what it takes to narrow a search in order to find the best information. Lesson created by Alice Anderson, Heather Collins, Melia Fritch, Joelle Pitts, and Ashley Stark in 2015. This is the second version of the lesson. Information can be packaged in a variety of digital formats that have their own properties and can lead down certain information paths. 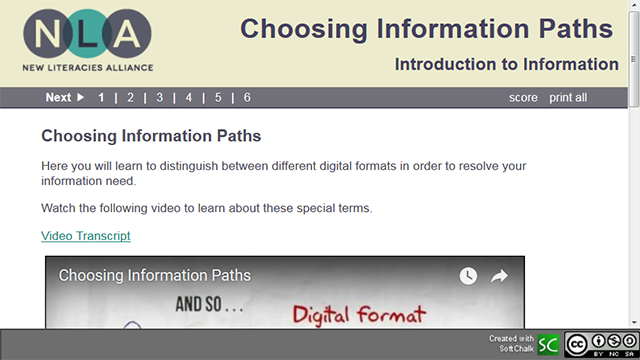 In this lesson, students will explore properties of digital formats in order to identify the best format to meet their information needs. Lesson created by Heather Collins, Holger Lenz, and Marc Nash in 2013. The digital literacy lessons below were created prior to the release of the ACRL Framework for Information Literacy and are therefore not aligned to any knowledge practices or dispositions. We have all experienced frustrations with technology at some point or another. In this lesson, students will explore solutions to some of the most common digital problems and logical ways to solve them. Lesson created by Alice Anderson, Holger Lenz, and Joelle Pitts in 2014. When technical problems arise, do you know how to ask for help? 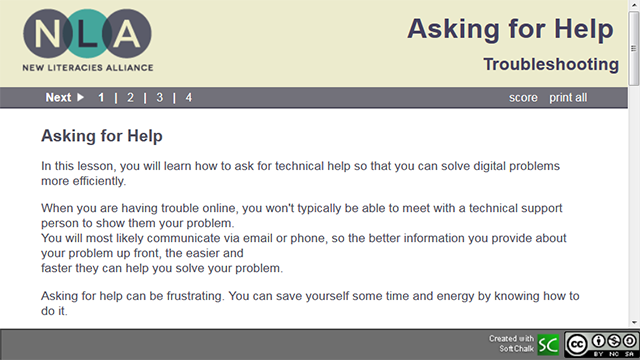 In this lesson, students will discover how to ask for technical help so that you can solve digital problems more efficiently. Lesson created by Joelle Pitts in 2013. Social Networks can be used in both personal and professional situations, and for a variety of purposes. 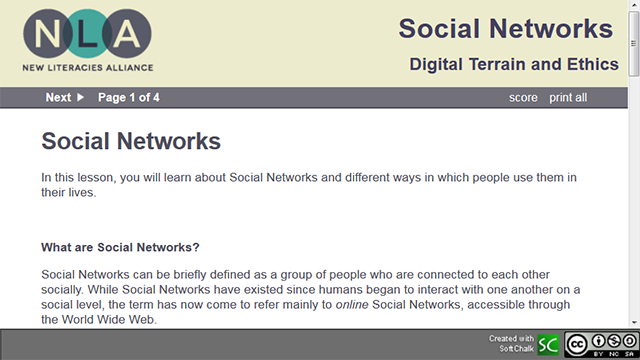 In this lesson, students will learn about Social Networks and different ways in which they can use them in their lives. Lesson created by Heather Collins, Anne Huffman, Holger Lenz, and Marc Nash in 2012. Do you know where to go if you need help while visiting a web page? In this lesson, students will examine common web page organizational strategies so you know where to look to solve problems quickly. 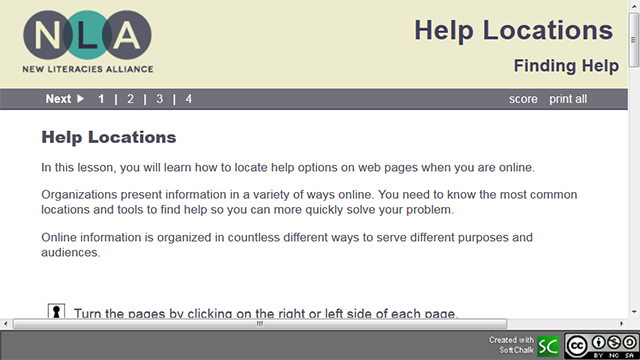 There are many help options available when assistance is needed to complete an online task. 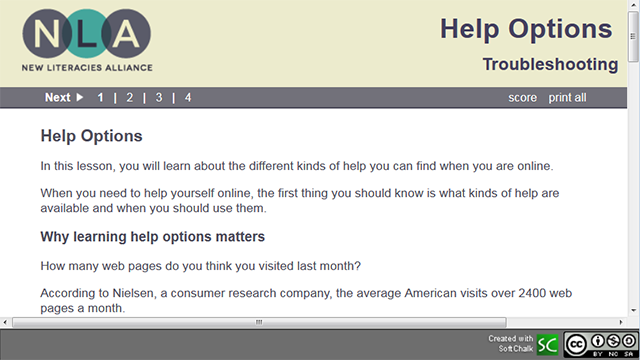 In this lesson, students will explore the various types of online help resources and where you can find them.